The beta coefficient formula is a financial metric that measures how likely the price of a stock/security will change in relation to the movement in the market price. 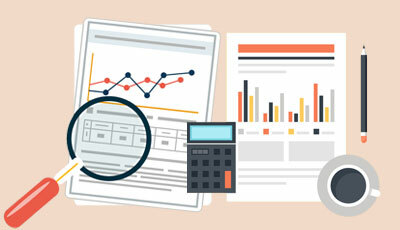 The Beta of the stock/security is also used for measuring the systematic risks associated with the specific investment. 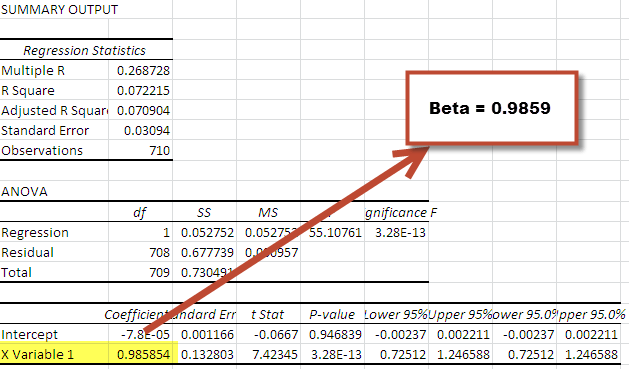 The beta is the degree of change in the outcome variable for every 1 unit change in the predictor variable. A standardized beta compares the strength of the effect of each individual independent variable to the dependent variable. The greater the absolute value of the beta coefficient, the stronger will be the impact. The Beta is calculated in the CAPM model (Capital Asset Pricing Model) for computing the rate of return of a stock or portfolio. If the coefficient > 1; the returns from the security are more likely to respond to market movements thereby also making it volatile. If Apple Inc’s (AAPL) beta is 1.46 it indicates that the stock is highly volatile and is 46% more likely to respond to movement in the markets. On the other hand, say Coca-Cola has a β coefficient of 0.77 indicating the stocks are less volatile and 23% less likely to respond towards movement in the market. As a trend, it has been observed that utility stock have a CAPM Beta of less than 1. On the other hand, technology stocks have a Beta coefficient of greater than 1 indicating a likelihood of higher returns with more associated risks. 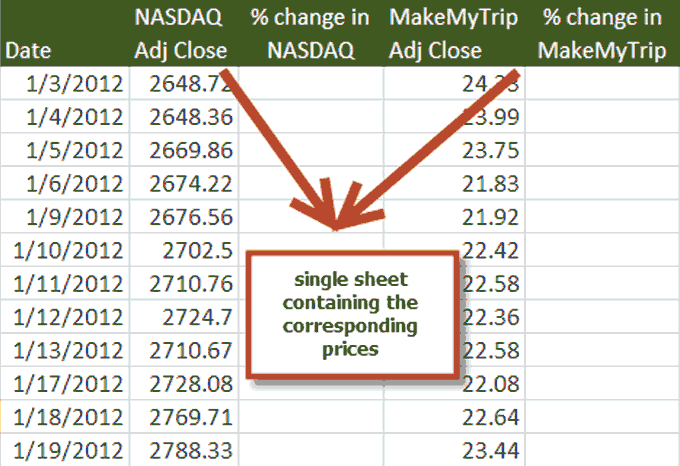 Here we will take an example to calculate beta of MakeMyTrip (MMTY) and the Market index as NASDAQ. 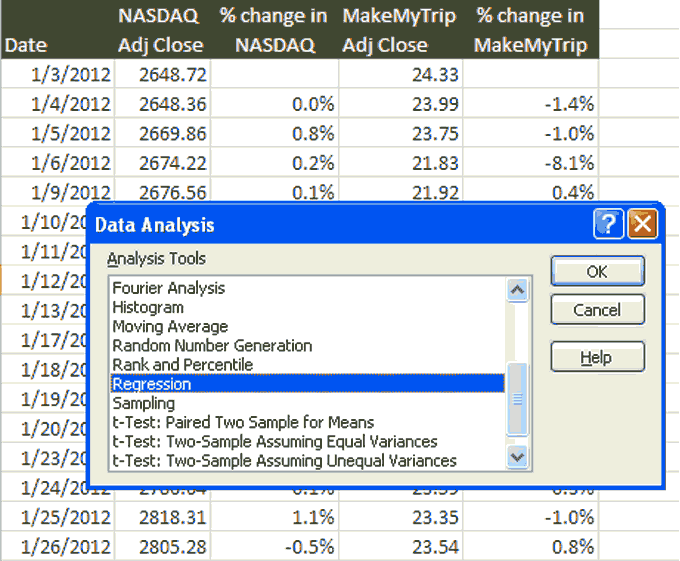 You may download the fully solved Beta Calculation Excel Worksheet from here. I have downloaded the data from yahoo finance. For Makemytrip prices, please visit this URL here. 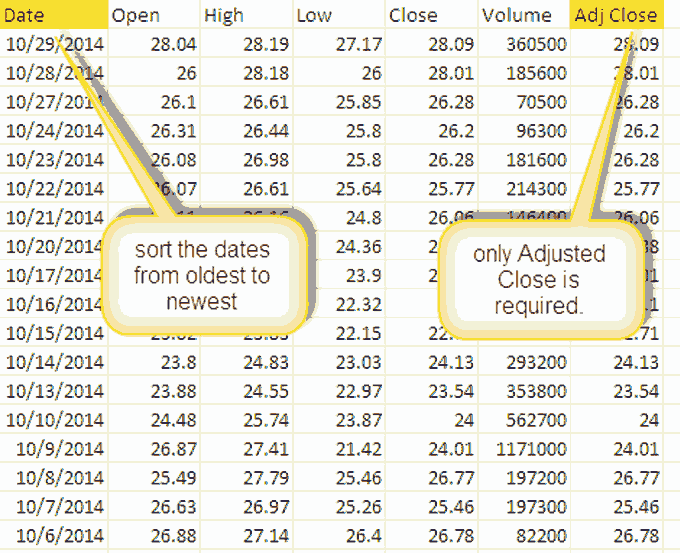 Sort the dates and adjusted closing prices in the ascending order of dates.You can delete the remaining columns as we don’t need those for beta calculations in excel. 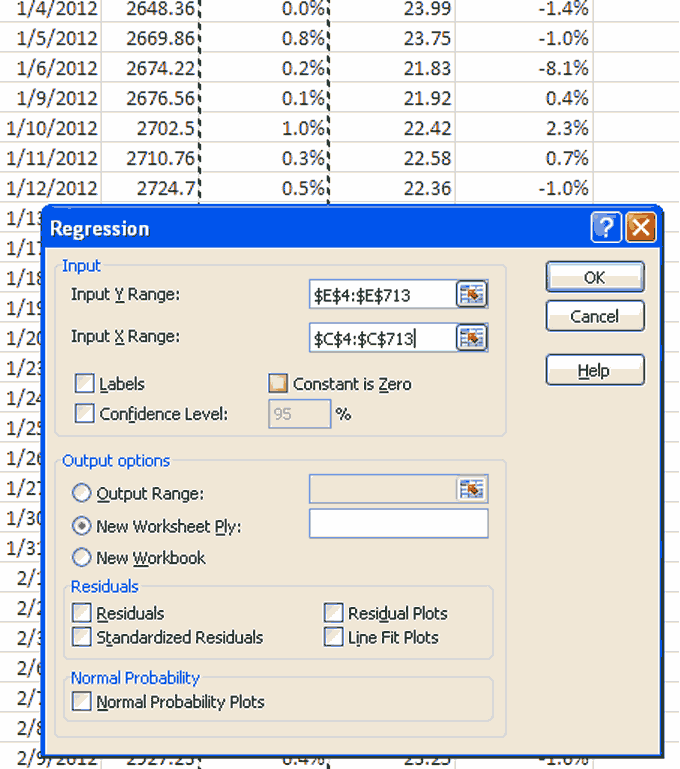 To use this regression function, select Data analysis from the Data Tab of your Excel Worksheet. You will get the same Beta in each of the three methods. 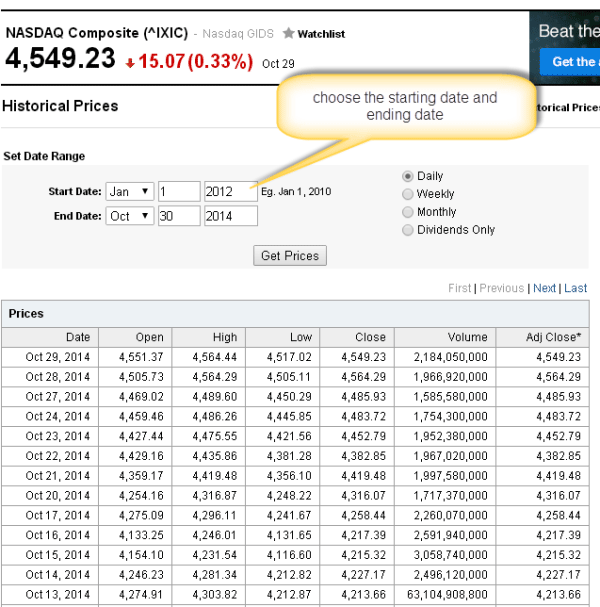 It is used for beta regression is to estimating the Cost of Equity in Valuation models. CAPM estimates an asset’s Beta based on the systematic risk of the market. The cost of equity derived by the CAPM reflects a reality through which how investors have diversified their portfolios for reducing the impact of the unsystematic risks. It offers an easy to use beta calculation in excel which standardizes a risk measure across multiple firms with varied capital structures and fundamentals. There is a heavy reliance on past returns and does not consider updated information/other factors which can impact the returns in the future. Beta regression as more return is garnered, the measure of Beta changes and so will the cost of equity. Though systematic risks are inherent to the market in explaining asset returns, the portion of unsystematic risks is ignored. A negative beta formula means an investment that moves in the opposite direction against the stock market. When the market rises, the negative beta tends to fall down and when the market falls, the negative-beta will tend to rise. This is generally true for gold stocks and gold bullion. Since Gold is a more secure store of value than currency, a crash in the market prompts investors to liquidate their stocks and convert into currency (for zero beta) or purchase gold in case of negative beta coefficient. A negative beta is not highlighting the fact that there is an absence of risk but it means that the investment offers a hedge against an unforeseen market downturn. However, if the market continues to rise, a negative-beta coefficient strategy is losing money through opportunity risk (loss of a specific chance to earn higher returns) and also inflation risk (rate of return not keeping pace with the prevailing inflation in the country).